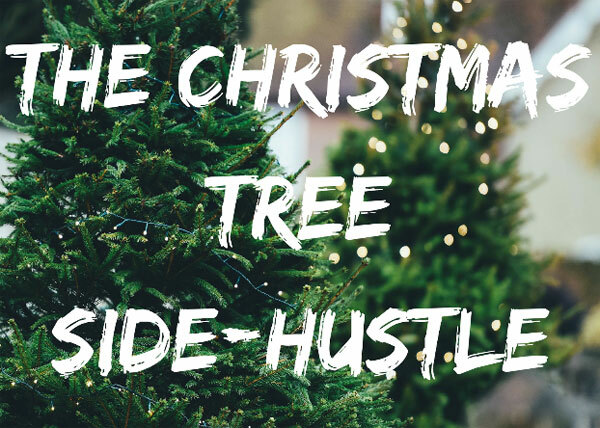 Side Hustle #68: Make Money Selling Christmas Trees! Have you ever seen those independent Christmas tree salesman on the side of the road and wondered how much they make? Well, it’s your lucky day my friend, because I am one of those tree salesman! So high-5 your grandma, hug a baby, or fist bump your dog – I’m going to show you how to sell trees as a side ho-ho-hustle (sorry, that was bad). It all started one day when my wife and I were discussing extra ways to make money. I mentioned selling Christmas trees as something I think about every December and wondered how much those roadside stands make. Well, light up my nose and call me Rudolph – my wife told me that she had a distant relative who sold trees as her main source of income! We had someone who was in the business to help show us their Christmas tree ways. We headed right over to talk to her. After our little chat, she told us that she made $100,000 a year between two stands. I was sold. She agreed to connect us with her tree farm and we were in business! Now, let me start by saying that I did not expect to make 50 G’s our first year. She had been in business for years and built a clientele that knew and trusted her. That being said, our conversation did make me realize the potential, and it was time to hustle! Step #1: Find a Good Location! The first step is to find a location. This is the the most important step. Just like in real estate, the tree business is about location, location, location. December is a great time to search for plots of land to set up shop for next year. You want to look for high traffic lots that do not have any competition nearby. Preferably a place that can provide electricity for your lights (otherwise you will have to get a generator) and running water. A great place to start would be your local flea market. See if they have a tree guy. If not, try to get some space! Trees sell like crazy at the flea market! 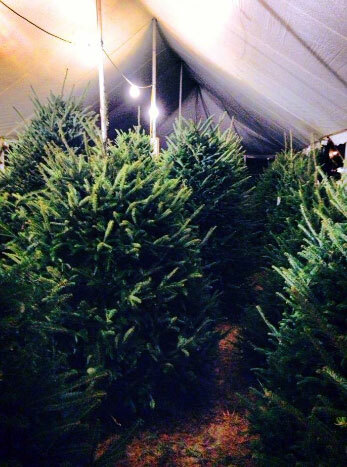 Our local flea market tree stand sells over 400 trees in a 10 days! The guy could sell more, but he prefers to go home and drink eggnog once he sells out. This translates to about $20,000 net profit in 10 days! Not only do flea markets generate foot traffic but they are usually already covered and somewhat secure, which can reduce your overhead tremendously (we will get into this a little later). The second place to look would be local schools and churches. We set up at a local church in town. This is a fantastic arrangement for the beginner. Instead of making a rental payment on a plot of land, you give a percentage of sales to the church. Local public schools will take the same arrangement (That’s where our tree mentor set up). It becomes a win-win situation. They make money on their land without having to organize volunteers, and you have a high traffic spot to set up shop. Another benefit to this strategy, is the church members (or students parents) will be more inclined to buy their tree at your stand since they know part of the proceeds go to their school/church. You can even ask them to put a little ad in their newsletter or bulletin to let members know there’s a tree stand on their campus. We arranged to give 10% of the tree sales to the church. This in turn hedges your risk, if you don’t sell, you aren’t obligated to the overhead on your rented space. Once you have your location, it’s time to order your trees. Most tree farms will set you up on credit and you pay for the trees after the season. This is nice benefit when you’re starting out because you can allocate startup cash to other areas of your stand. We ordered 200 trees worth $7,000 our first year. I will break down each size and how much you can make a little later. You want to order your trees a few months in advance to ensure they have enough to fulfill your order. You definitely want to have a cover over your trees. Sunlight can seriously damage and dry out a Christmas tree. This will be your biggest out of pocket cost up front. We rented a 100 foot tent for $1,200 for the month. The company came and set it up with their crew. They also took it down when we were done. This may be something you want to invest in if you decide to go all in on selling trees, but it will run you $10,000-$15,000. You could create a 2nd side hustle by renting out your tent for the other 10 months! There are a few supplies you will want to pick up before you get your trees delivered. Step #4: Get Your Stand Set Up Properly! Here’s the trick to a Christmas Tree stand that will set you apart from the rest: You want people to step inside freakin’ Narnia when they enter! A forest of upright trees. At any given time you want to have about 40-50 trees on display so that your customer can see all angles of the tree. This is a game changer for your stand. People love it! Most places just lay their trees in bundled piles and the customer has no clue what the tree looks like until they get home. Don’t be this type of stand! 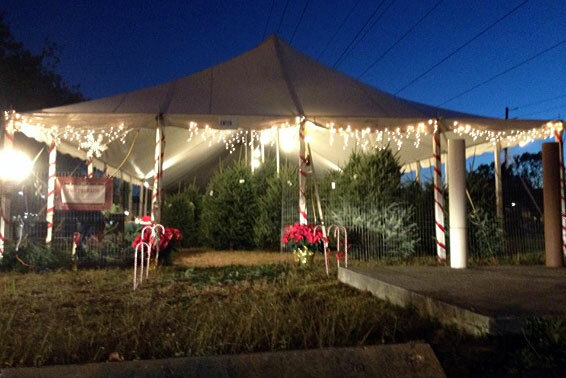 We set up our trees on poles and strap bungee cords to keep them upright. You want to stake your poles before the trees arrive. That way when they come in, you can display your first 50! Lighting is a must as most of your customers will be coming after work when it’s dark. The brighter the better! We get workshop lights from Harbor Freight and hang them from every corner. They don’t need to be able to see it from the international space station, but a well light stand will result in people feeling safe and secure stopping by your stand. If your location doesn’t have an electrical outlet, you will need to rent a generator. This can increase your cost ($300-$1,000) so keep this in mind when you are looking for locations. The best time to open your stand is the weekend before Thanksgiving. We all have an Aunt Phyllis who wears a Christmas sweater that lights up before Halloween. Well, those people want their trees as soon as possible, so be the first in the business! Schedule your trees to arrive a week before Thanksgiving. They will come in a huge semi-truck. If you have a good tree farm, they will have just cut the trees a few days ago which makes them really ‘fresh’ (this is a huge selling point that we will talk about later). Ours are so fresh they still had snow on them! You’ll need a few helpers to unload the trees. We hire a few high schoolers to help out for $10 an hour. The most important thing you need to nail down is your sales pitch. You’re not giving your customer a wrapped up tree and throwing it in the back of their mini van. You are giving them a fresh tree that was just cut a week ago. A little known fact, the big box stores cut their trees in early October, sometimes September, which is why their trees dry out and lose their fragrance. Make sure the customer knows this as they look through your trees. As you talk to them, you need to develop a relationship. This is where you get repeat customers and referrals year after year. We have a very large percentage of people who come to our stand just via word of mouth. So How Much Can You Make Selling Christmas Trees? Those prices for big trees may seem outrageous at first glance, but people will pay for them. We sell a handful of monsters every year. I cannot tell you how many times people will come in and say “I want your biggest tree”. Boy, oh boy, do I love selling it to them. The sweet spot is the 6′-9′ trees. The majority of our sales come from those trees. They have great margins, and can fit in the majority of your customers homes. When someone purchases a tree, you are going to cut off some of the lagging branches at the bottom. Those branches can turn into additional revenue sources by making live wreaths (who says money doesn’t grow on trees)! We sell small wreaths for $20 and large for $35. There are plenty of youtube videos on how to do this, so I won’t bore you with the details. This brings in an additional $1,000 for us. They look amazing too! We also sell tree stands. I make sure to ask every person if they need a stand (we always sell out!). We order 3 sizes that will fit all tree types. Depending on the size, we buy them for $5 – $20 and sell them for $20 – $40! This is a great seller because if someone does not have a stand, you can put it on their tree before they go. All they have to do is stand it up when they get home! The last of additional revenue is poinsettias. We found a guy who sells GIANT poinsettias for $5 a piece. We sell them to our customers for $25 each. Not only do they make the stand look nice, they sell like crazy! We sell out and re-order many times throughout the month. It’s the WOW factor. It also makes the stand look very festive. Customers (the ladies especially) love this and almost always add them to their tree purchase. How Much Have I Made Selling Trees So Far? This profit was after having about 20 trees leftover. The city did not like that our tent was under power lines on the main road so we had to move our stand behind the church which killed our visibility. With a better location, I truly believe we can sell well over 200 trees! The stand down the street (on the main highway), sold 400 and finished a week before us. We gave away the excess trees to the church who gave them to people in need. One downside for some to having a tree stand is that it’s labor intensive. If you don’t like lifting heavy things and putting them back down, this may not be the side hustle for you (bro, do you even lift trees?). You can hire a few employees to help you with the labor, but it can cut into your profit (especially when you are just starting out). A tree stand is also not a passive side hustle. You have to plan, organize, and put in the work to make it successful. That being said, this would be a great side hustle for early retirees. You work for one month a year on a business that can generate a nice chunk of cash to fit your lifestyle! To sum it up, a Christmas tree stand can be a great side hustle. You get to meet all kinds of people in the community, provide a product that brings cheer, and make money in the process. You can grow your stand with a great customer base that will return year after year. Maybe you can open a second stand and sell trees full time and work one month per year! How much better can it get? P.S. I know sometimes J. Money likes to exit in style with a musical bang, so I thought I would leave you with the Christmas classic ‘Christmas in Hollis’ by RUN DMC. 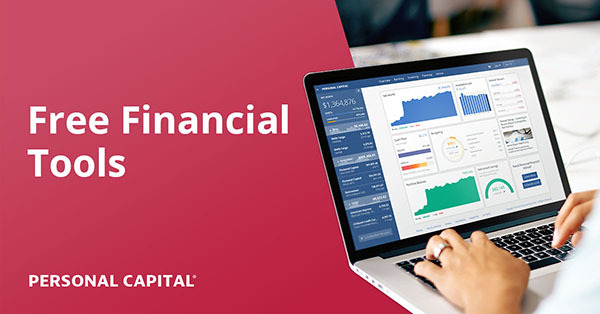 Andrew is a financial analyst by day and a money blogging vigilante by night. He is the creator of the blog Dollar After Dollar where it’s all about the benjamins baby! He writes about personal finance, real estate, and keeping it 100. Killer side hustle idea! I live on a busy street, so maybe I could try selling them right from my front yard. Haha. Not sure my neighbors would go for it, though! I think it’s worth a shot! Give the neighbors 10%! If your street is zoned residential, you may run into issues. There’s reasons why businesses, even temporary ones, cannot be set up in residential streets. That’s to protect the home values. You’ll need a permit from your local government, too. You’ll need to check your street’s zoning codes. Most residential areas do not permit businesses, even temporary ones, to be set up. The zone codes protect home values. Either way, you’ll need a permit from your local government to set up a stand. In my city, stores, churches, etc. cannot give you permission to set up a business on their property without the appropriate business permit. Doesn’t cost much, but you need one. Just do your due diligence so all your work isn’t for nothing. What a side hustle! Never thought tree stands were so profitable but that’s a nice deal! I only recall one stand around us so the market may be for the taking. Plus I live in NC which has a ton of Xmas tree farms! Thanks for the break down. That sounds like an opportunity to me Green Swan! Our ‘tree mentor’ was the first in her area. She developed a strong relationship and now has the majority of the business in that area. She only competes with the box stores. Our tree farm is from North Carolina and they have been awesome! I would 100% agree that it is location specific Tara. I think 2 or 3 stands in a town is where it maxes out. If there’s one on every corner the pricing becomes a race to the bottom by the end of the season. That’s a fun fact about T-Swifts parents, I didn’t know that! $29.99 is a bargain! They must sell a boatload of trees! ….and in Connecticut we paid $5.00 for our tree at a cut-your-own farm. Thanks for the in-depth breakdown, I was curious how much they went for wholesale. We bought our tree from a big box store a few years ago, half the needles ended up on my floor. I’ve got a little trick for you next year when you buy your tree. Water with 1 part Coca-Cola, one part water, when you first bring home your tree. The sugars in the coke will cause the trunk to seal in the water. This in turn will make your tree last much longer! Kiss dry branches goodbye (I sound like an informercial). I had one customer tell me their tree lasted until March with this method (although I don’t recommend keeping your tree that long from an interior design standpoint)! The big box stores always cut their trees too early. I would ask the folks at the stand down the street when theirs were cut. It should be less than a month. Good article I think I may use some of the info in my venture. In my case I will have about 3 acres to put christmas tress in and about 1/2 to 3/4 we’ll use for a pumpkin patch during halloween amd thanksgiving. Cut your own. Do not mix anything in your water for your Christmas tree, Cut Christmas trees will use a gallon of water per day. the best thing to do is to have a towel and wrap it soaked in water around the trunk of your tree and immediately cut about an inch off of the truck (no angles) and put it in its stand and fill the stand with water as soon as you get home. A good fresh cut tree will last for about 8 weeks (depending on type.) When I was a kid and still today we had a tradition, We bought the tree thanksgiving day and took it down the first weekend after the new year! Cutting the tree again after you get home will remove the sap the tree used to seal its self. You need to try to keep it unsealed so it can drink all the water it can. I always knew there was money in the banana stand, but who knew the Christmas tree stand could be so lucrative? Nice hustling. That Shark Tank article is really interesting. We are considering delivering trees next year. People call in with their size, we deliver, and set up their tree (stand and all)! You’d be surprised how many customers ask for this! It might be a great 4th revenue stream for the stand. Interesting idea – esp. the long term potential for growing and expanding. Is a good rule of thumb (based on your open hours above) ~50 hours per week? Just trying to calculate a profit / hour for comparison. You are right on, Paul. It’s about 50 hours per week. Most side-hustles are a marathon, usually working 12 months of the year. This is an all out sprint, averaging about 200 hours in a month. Our first year it ended up being about $37.50 an hour (200 hours). Next year we plan on making a minimum of $2,000 more since we already have all the equipment. So we will in turn make about $47 an hour. Another option to reduce your hours is hire a college student (usually home for the holidays) or high school student for $10/hour. You make less hourly, but can sit back, relax, and enjoy the holiday cheer. The best part is, the potential growth long term is endless! Thanks for reading Free To Pursue! I’m glad to hear someone supports the little guys! This is nuts! I can’t believe how profitable selling Christmas trees on the side can be. I never thought about it lol. I’ve always been an artificial tree person. But this is really neat. :) I always thought you had to grow the trees yourself, but I didn’t consider you can just buy them from a wholeseller. If you’re into labor, it sounds like you can make a sweet little paycheck at the end of it all. :) I don’t think it’s something I would personally try out, but it’s neat! It definitely take some hustle muscle! I like to look the part. I wear the red flannel shirt, jeans, and boots. My “tree mentor” doesn’t do any of the heavy lifting. She has grown to the point where she can hire a crew of helpers to run her stands. She just organizes and collects the checks! Oh man, I had the perfect spot for this by me. A church bought a big plot of land in front of a ton of upscale homes and they haven’t started building on the land yet. It would’ve been perfect! No way to subscribe to comments? Sounds like an opportunity for next year Ken! Stands near upscale neighborhoods traditionally do extremely well. Adding to our list of upgrades for the future! We used to have comment subscription but killed it cuz it kept messing up stuff :( Now that I have a team here though it’s going right back on the list, thx for the reminder! This is a really interesting business that I didn’t know anything about, so thanks so much for sharing these numbers. I set up my own impromptu Christmas tree selling business this year, since I happened to find two artificial Christmas trees thrown out on the side of the road this past summer. I’ve been hanging onto them until now and just recently sold them both. Managed to bring in $70 for the two of them, and at a startup cost of $0, I was pretty happy with that profit. Sounds like a great deal to me! It would be interesting to put up a craigslist add and pick up artificial trees people plan to throw out. Then, keep them in the attic and turn a profit next Christmas. Thanks for reading FP! That’s a great seasonal side hustle. It sounds like you made a bundle in just a few weeks. I’d have to hire some employees, though. I’d throw out my back on day 1. It does start to wear on the body by the end of the month. Some of the monster 12′ trees can weigh a few hundred pounds! I am hoping to transition to employees once my volume increases. That’s one hell of a side hustle! Definitely not one I’ve heard anyone else talk about. Sounds like a lot of fun too. Nice work! It’s a blast! You meet so many cool people along the way! I did not realize precisely how lucrative the business was. One year, I did not have the space for a tree, but wanted a wreath. The local stand did not have wreaths, but gave me some of the loose limbs on the ground. My very talented girlfriend turned it into a really festive decoration that fit my apartment. It smelled wonderful. Once I have a place that can accommodate a tree, I will be sure to go back to that same stand that treated me so well before. That is a great way to do it. We had loads of branches left over and we gladly would give them away to folks who asked for them. Most tree stands don’t want the headache of having to dispose of branches. You can make some really cool wreaths for free by doing that! Goodness gracious! I didn’t know tree stands were so profitable! This is an awesome side hustle considering you only have to do it during one time of the year. Exactly! It’s the side hustle sprint! Interesting read J$ Money! I never thought about those Christmas tree stands as someone’s side business before! Yay! That is a good source of income from selling Christmas trees. I never thought that it would be that big and a good side hustle. Thanks! I like the hustle behind this! And your tree stand looks gorgeous by the way – it’s so cute with the twinkling lights, and as you say, having the trees actually stand up looks so much better! Thanks Avery! We love the forest effect. It’s a much better experience for the customer! My family sells “cut your own” Christmas trees and we have for over 50 years! People come from other states to buy them. 80 acres of trees. ZERO advertising. My brother (owner) sells about 1000 trees per year. All trees $60. * trimming trees and getting stung by bees!!! So cool!!!! What a neat family biz! This seems like a little too much work for me, but the profits are pretty attractive. We made trees out of pallets which are free from warehouses. Painted them green, about 30 minutes work. Sold them at the local market this past weekend. Plan to do it on a grand scale next year, they were very popular! I gotta argue with the sponsored Lyft ad, as my friend is struggling to make ends meet driving for them. Drivers don’t make $20-40 per hour like they claim, not even before taking out expenses (the company’s cut, gas, wear and tear, extra cleaning, taxes). Other than NYC, drivers make $9 – $11 an hour, pre-expenses. After expenses, you’re looking at right around minimum wage. Mainly because we published it at the height of all the ride sharing goodness which seemed to help a lot of people – and still does from the look of traffic we get. I still think it’s a valid side hustle though just like any others out there – some will work for you and others won’t depending on what you’re looking for and enjoy/etc. Great article! I had no idea there was that kind of profit there. You’re working for your money though, hoo! All the lifting, organizing, selling, and coordination. Nice side hustle! My dad used to grow Christmas trees. He’d buy seedlings for six cents apiece (yes, six cents) from the state division of agriculture and plant 1,000 at a time. This is a lot easier than it sounds when you have kids (and later grandkids) who will do the work with you. He’d mow between the rows during the summer and throw down some weedkiller. Once a year or so he’d trim them to shape if needed. And yeah, the money was really good. Then he found a better way to do it: Sell entire fields of trees to a landscaper. The guy gave him sums of money and required NOTHING ELSE. His own guys would come down to trim, and would dig them up as needed. Approaching schools and churches also made me think it would be good to print up some early order forms and offer it as a fundraiser for local PTA, churches, and libraries, etc. Once your location is set, the order can be to pick up trees the weekend before Thanksgiving, or delivered the week after fir an extra fee. You’ll start off with a bang, and maybe even sell a large $400 tree to the organizations themselves for display in their building. Yeah! That does sound like a good idea! I’m in Ft Pierce, Florida and want to get in on this hustle. I’m always into something to make money. Looked up tree wholesalers, but there’s a ton. Will you give your source and how do they usually charge to deliver? Thanks my hustle brother from another mother. Any tips On how to find a supplier that will issue a line of credit? We live in Alaska and my boss owns a castle he has agreed to let me sell Christmas trees there. Great article! I know this will vary state by state but I’m curious about which local business licenses and permits you needed to acquire before opening. Also, what was the rough breakdown of your 200 trees by species and size? We’ve got a vision for a stand this winter and came across your article. Your thoroughness was exactly what we were looking for. Years ago, as an early retiree, my wife and I set up a Christmas Tree lot in a great location in Stockton, Ca. We did it professionally, chain link fence, extensive overhead lighting which we set up ourselves. We had banners. 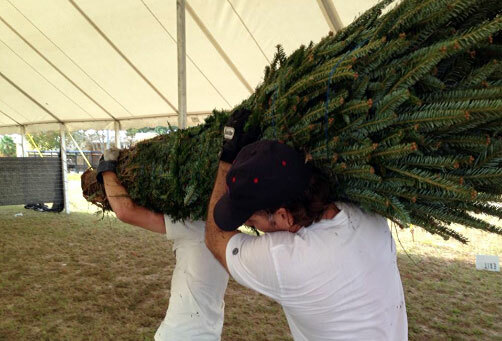 We made our own stands and hired locals to help us unload the trees. We had a 36′ class A motor home that we lived in for the month, on site. We bought 1,000 trees that came in two shipments out of Oregon. We opened the day after Thanksgiving and closed on Dec. 22. We sold all but twenty trees that had dried out, and we set them on the sidewalk outside of the lot and they were all gone by the next morning. It was an incredible amount of work, but profitable. No free lunch, and we only did it once.